Over the next six months Trinity occasionally revisited the topic; asking the same questions and pondering the answers. You could almost see her mentally weighing the value of it against her fear of willingly placing herself in a situation that involved physical pain. Pierced ears. It’s a special event in a girl’s life. I had to wait 13 agonizingly long years before I was allowed to take that step. While imposing no age restrictions or decrees on my daughter, I was adamant that the impetus for this event come from her. It had to be something she wanted to do with a full understanding that it involves a little pain and a six week commitment to careful care while they heal. Her inquiries started to fluctuate between wanting more details of what the process entails, to asking if she could get her ears pierced one day, to deciding she didn’t want to. Thus far we had answered her questions of permission with vague “some day” answers. While apprehensive about facing a little pain, she was unwaivering in her decision that it was time. Today was the big day. I certainly shared in her excitement! She carefully chose her outfit so it would match the earrings she had chosen for the big event. (Oh yes! We perused online to see what her options were ahead of time!) To mark the importance of the occasion I wore one of my favorite shirts. The one she always comments on when I wear it for a date with Andy or a girls night out with friends. Today, I was dressing up for HER, because important events warrant looking the part. That brings us to a google butterflies. She was soon sitting in a tall chair in ‘Claire’s’ grasping my arm with both hands as all the preparations were made. Tears filled her eyes as she watched the sterilization process. “You don’t have to do this if you don’t want to.” I assured her. “I do,” she said through the tears. “I want to do it.” The exact spots were debated, corrected, and marked. Trepidation filled her eyes as two ladies took their places on either side of her. I stood in the center and she held both of my hands. “I love you. You’re so brave and you’re going to be just fine. It will be over before you know it,” I told her. She leaned into me for a hug to chase away the temporary pain. “You DID it! It’s all over! Look how pretty they are!! Do you want to see?” I asked, knowing the excitement of seeing her newly pierced ears would erase all memory of the pain. My exhortations were soon joined by complete strangers, including a mother and daughter who, unbeknownst to Trinity, had been standing outside the store window watching the whole thing. “You were so BRAVE!” they said. “Those are such pretty earrings! !” A bashfully pleased look came over her face. She reached for the mirror being held out so she might inspect her new look. 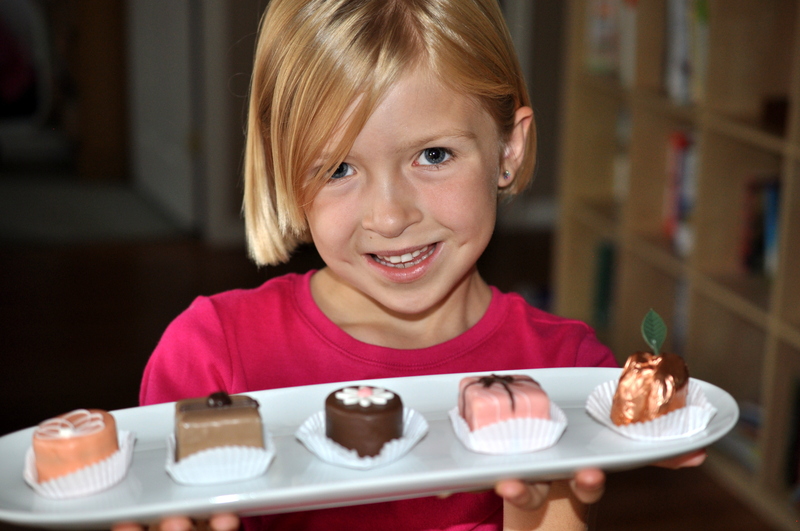 That is how we came to pick out the most delectable Petit Fours to bring home and celebrate with Daddy and Lilly. Of course, a little immediate gratification is sometimes in order so we plopped ourselves onto a bench and munched on a few cherry-sour candies for our own private celebration of the moment. We made one more stop on the way home. Sushi is a favorite, but rarely indulged in, treat. It seemed a fitting dinner to commemorate the day. I mean, what says “Congratulations on a lifetime milestone” more than eel, avocado, and tempura shrimp? Do you want to see her new look? OMG!!!! Adorable, fun, tear jerking & sweet!! Congrats Trinity, they look beautiful but not as much as you do!! 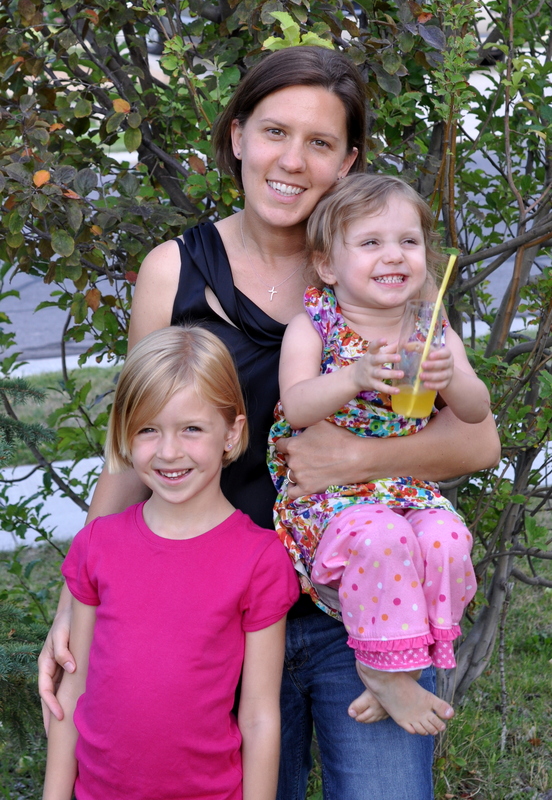 Sarah – please write a parenting/mommy/encouragement book. I’ll be the first in line. I have a lot to learn from you, my amazing friend! Awww – so so sweet 🙂 What a great thing! GO TRINITY! I love what Andy did with the earrings too. I love the way you celebrate the milestones with your girls. 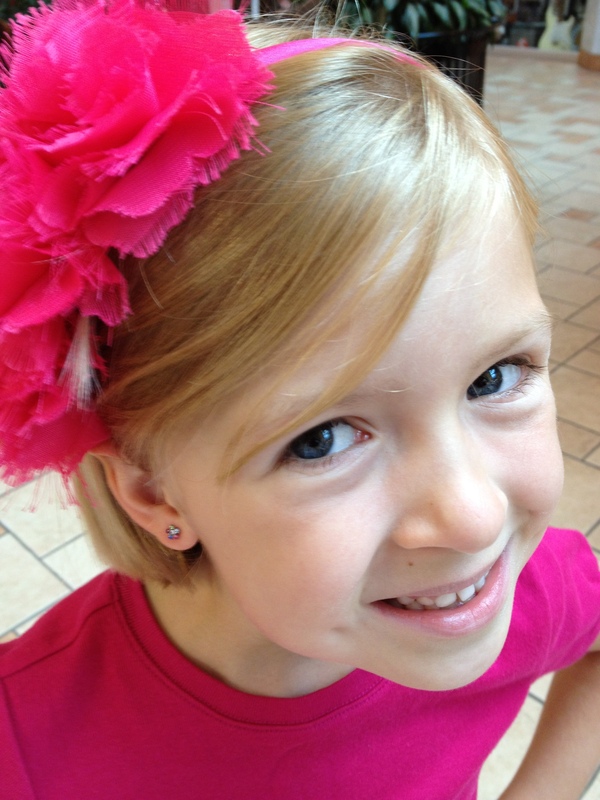 And Trin’s new earrings look absolutely beautiful. Way to go Trin!!!! Thanks mom! She’s such a big girl!! Thank you!! She’ll be ever so excited to show them to you at Thom’s wedding!